Ricotta (literally means "recooked") is a very popular cheese in Italy. It's a fresh soft cheese and it's so popular because it's good (of course! ), not too fat (13%) compared to other cheeses and can be used in a lot of different ways. First it can be enjoyed as ... well... cheese! On the bread with ham or shrimps. Secondly it is often used in baking. Ricotta is key the component of many Italian desserts such as cheesecakes and cannoli siciliani. Lastly it is often used in savoury dishes like pasta, lasagne and cannelloni, ravioli and so on. 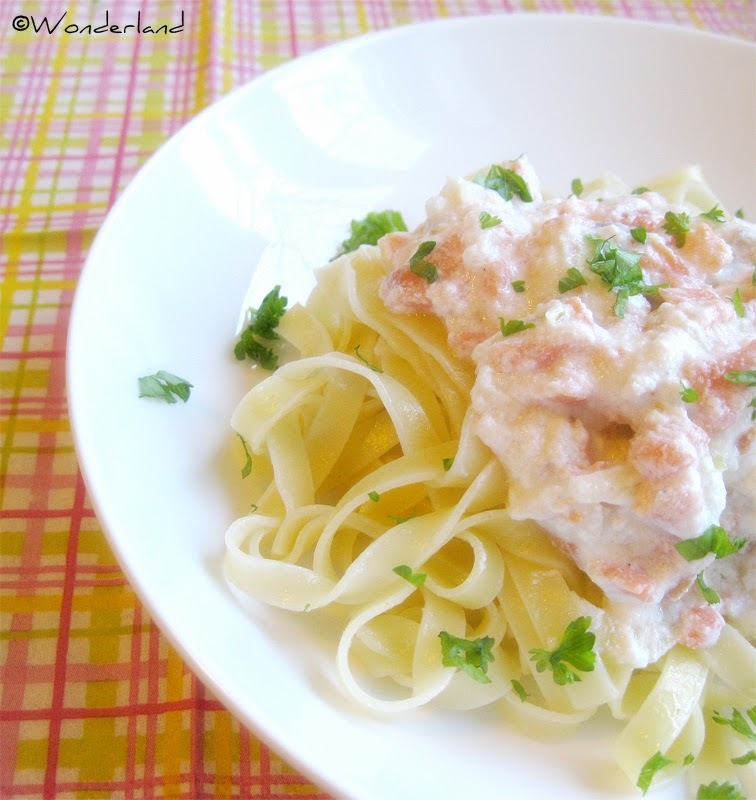 In this recipe, I made a sauce for my tagliatelle using fresh ricotta cheese and salmon. Put a pot of salted water on to boil. Slice onion and salmon in thin slices. Saute the onion in a saucepan with oil over medium heat. When it becomes soft add the salmon and cook at medium flame for some minutes. Pour the wine and let it evaporate, then add ricotta and 3 tablespoons of the boiling water for the pasta. Stir well so it becomes a soft cream, add salt and pepper up to taste. Drop the pasta in the boiling water and cook until al dente. Drain the pasta and pour it into the saucepan with the ricotta and salmon sauce, and stir well.